Google Chrome 5.0.375.55 is the current stable version for Chrome, and the very first stable for Mac and Linux. You can find more information for the stable release on the Google Chrome Releases blog post. More details about what’s specifically new for the Mac version can be found on the Official Google Mac blog. Flash integration will be enabled by default with the upcoming Flash 10.1 release! Really exciting news for all Mac and Chrome fans! 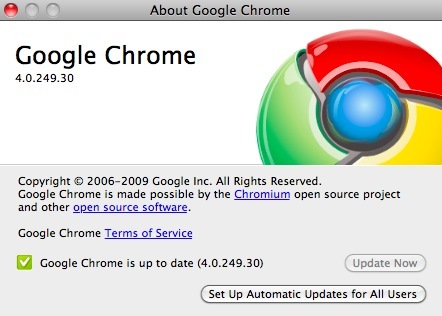 The first official Beta version of Google Chrome for Mac has been released today. The version number is 4.0.249.30. Google Chrome browser … Google Chrome OS … and as of today Google Public DNS! Google has just announced the release of a new public free DNS service. The aim of this service is to make the Web even faster and safer for everyone around the world. Here is how to configure your router or computer to start using it. Until now the major alternative player to the default ISP DNS servers was OpenDNS. It’s really interesting that shortly after Google’s announcement, there was an immediate answer by the Founder of OpenDNS, David Ulevitch. He is making some really interesting points. Twitter already hosts tweets/comments about both OpenDNS and Google Public DNS, you might try searching there for other people’s opinions. Asking which service is faster, is not that easy to say yet, as results differ from country to country, and of course it is only a matter of a few less or more milliseconds for each request. You can try both services, read what each one has or promises to offer, and decide for yourself. Fall in love with … Google! Well, not exactly with Google, but with the aid of Google! You can find more stories on the Search Stories YouTube channel.